So why on earth haven’t more of us heard of it, let alone been there? Well, now I have been. And I’m even more amazed that the exposure generated by the ’98 Nagano Winter Games on Honshu, the main island of Japan, failed to put Hakuba on the skiers’ map. After all, we travel as far when we go to many North American resorts. Flying time from London to Tokyo is similar to London-Denver (for Colorado’s ski areas) or London-Vancouver (for Whistler Blackcomb, host of next February’s Winter Games). What’s more, transfer time to Hakuba station by super-fast bullet train is 90 minutes. Road transfers to some resorts in Colorado or California, for example, far exceed that. The ten Hakuba ski areas, easily linked by car or bus, comprise more than 200 pistes and thousands of skiable acres, rivalling many North American and European resorts. Of course the culture of skiing in Japan could not be more different. Personally, this is something I found spiritually uplifting and good for my soul. I liked swapping apres-ski schnapps for sake, the national Japanese rice wine, of which there are hundreds of varieties. It was also refreshing to trade typical Western alpine fare for its Eastern counterpart. Tofu or tempura instead of tartiflette, sushi and sashimi instead of salami. And instead of spaghetti – udon noodles or ramen, a hot bowl of meaty broth with bean sprouts, grated pickles and toppings such as sliced pork or an egg still poaching in the soup. This is always hearty. And I urge any visitor to Japan to try Kobe beef. It is sublime. But if you can’t handle the taste transition, there’s no need to worry – there are Western restaurants everywhere in Hakuba selling cheeseburgers, hot dogs, plates of ‘spag bol’ or a traditional fry-up. These things are fashionable, as noodle and sushi bars are in Britain. One restaurant I braved in Hakuba, called Miyama, was the culinary equivalent of extreme skiing. I found myself cooking and eating offal in the form of heart, third stomach, reproductive gland with contents and bowel! Plenty of sake went down that evening. Onsens are Japanese hot tubs or, at their best, natural thermal rock pools in the woods or foothills. This is an apres-ski tradition I particularly like. It is almost mandatory to bathe naked in man-made onsens found in hotels or public spa areas. The ritual also demands thorough washing in individual shower compartments before entering the hot thermal waters. This is as much part of Japanese daily life as saunas are to Scandinavians. It is physically and mentally cleansing and relaxing. Until the Americans occupied Japan at end of the Second World War, men and women happily shared onsens. The Americans are blamed for ending that tradition. Two onsens I can recommend in Hakuba are Obuya – which has large copper pots to bathe in after washing – and Kurashita No-Yu – which enjoys fine views over the ski slopes of Happo-one (pronounced happoohnay), the largest of Hakuba’s ski areas. This has more than 30 ski lifts and a wealth of terrain including the Men’s and Women’s Olympic downhill courses, to which I tried to do justice. It is definitely worth a trip to the city of Nagano to see the Olympic museum in the M-Wave speed skating stadium. Also take time to see the beautiful 7th Century Zenkoji temple, believed to house the first image of Buddha to arrive in Japan. The resort of Hakuba 47 – named for its twin goals of skiing in four seasons, seven days a week – is linked to neighbouring Goryu. This makes another large ski area with good terrain parks, an excellent, protected children’s ski area and a well-designed lift and piste network. The medium-size resort of Cortina will take your breath away when the impact of a Buckingham Palace-size, red-roofed mock Tudor mansion – the Hotel Green Plaza – hits you between the eyes. It looks as if it travelled in time to the wrong co-ordinates. Don’t miss the wild monkey onsen at Jigokudani about a two-hour drive from Hakuba and a 30-minute stroll up into the snowy foothills. 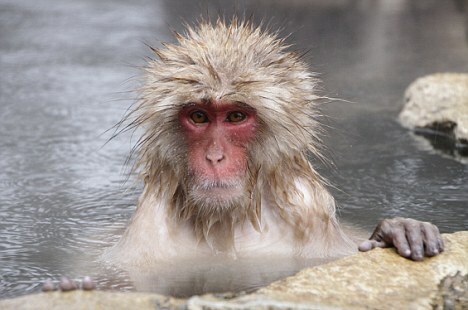 In the natural thermal waters of the rock pool some 200 genuinely wild macaque monkeys frolic through the winter days. Even with huge camera lenses stuck in their faces by tourists, they don’t acknowledge our presence. They carry on scratching, washing, eating, urinating and mating with a speed and nonchalance humans could never get away with. Given the close proximity of Tokyo and Kyoto, via the bullet train, it would be churlish to take a skiing trip to Hakuba without spending two or three nights exploring the shopping malls, temples and markets of at least one of these historic cities. A ten-day stay with seven nights in Hakuba and three in Tokyo would allow a lot of skiing and a fascinating city break. I stayed at the Four Seasons Marunouchi, which was perfectly located for the famous and frenetic Tokyo fish market. Like sake, the Japanese people and culture are intoxicating. I’ll be back. Neil English flew Japan Airlines (0845 7747700, http://www.uk.jal.com), which has a daily service from Heathrow to Tokyo from £589 return including all taxes. The Bullet train from Tokyo to Nagoya, near Hakuba, costs from £103 return. 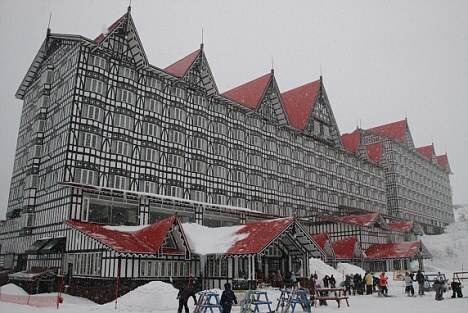 In Hakuba, Neil stayed at the White Horse and Black Diamond hotels in the White Horse group. A current special deal at the White Horse for seven nights with breakfast, plus six-day lift pass, transfers to and from Nagano and a day trip to the monkey onsen costs £800pp based on two sharing at current exchange rates. Deal code ARC009, www. whitehorsehakuba.com. In Tokyo Neil stayed at the Four Seasons Marunouchi, http://www.four seasons.com, where a superior room is from £360. For more information, visit http://www.seejapan.co.uk.